The Clemson Tigers, college football champions, visited the White House on Monday evening as a reward for doing a very good job. These kinds of visits traditionally involve a fancy meal, but the people who work in the White House kitchen are reportedly furloughed as part of the ongoing government shutdown. 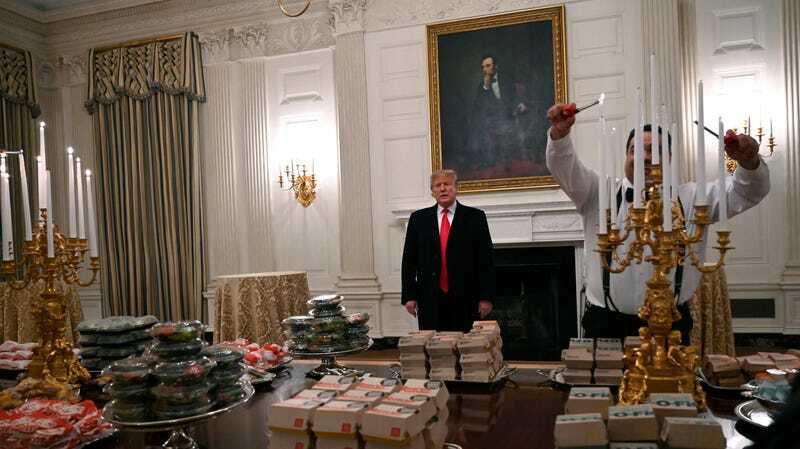 As an alternative, the White House provided the players with what I am going to go ahead and admit looks like an incredible spread of fast food. When introducing the meal—which included sauce packets displayed on silver trays that probably had something to do with George Washington or at least Herbert Hoover, I bet—President Trump said that, while he had considered having Melania and Karen Pence prepare salads for the football players, he instead opted for the burgers. Does Karen Pence puts bees in her salads? What do you think Melania puts in her salads?